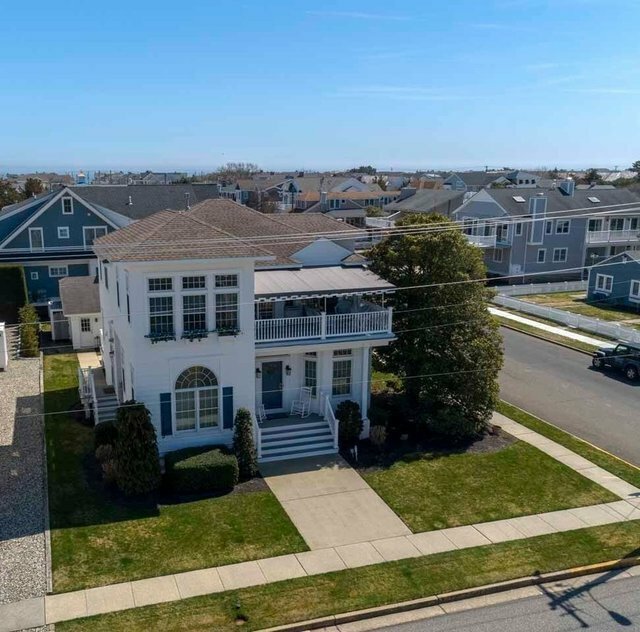 This immaculate beach home named “The lighthouse where the holly tree lives” is being offered for sale and is ready for your family to begin making Stone Harbor memories. The property sits on a 60’ x 110’lot and has been updated, pristinely maintained and is in turn key & move-in condition. You’ll fall immediately in love. The first floor features a grand entrance on Third Avenue, a large kitchen with ample cabinet space, and featuring a new white and beautiful quartz countertop w/access to the rear deck, living area w/ gas fireplace, dining room, pantry, office or 5 th bedroom, bedroom, hallway bathroom, linen closet laundry room and a door leading to the side yard. The first floor also features high ceilings, a tremendous amount of natural sunlight & transom windows on all windows which allows for the natural sunlight to brighten the home. The 2 nd floor consists of a grand stairway leading up to 3 large bedrooms; all en-suite with large walk-in closets. A front deck with bay views of Stone Harbor Basin and a beautiful new awning and a rear deck facing toward the beach. The flooring consists of oak hardwood, tile in the bathrooms and kitchen. All bathrooms have been updated tastefully with new vanities & granite counters, glass-enclosed showers, perfect wall lighting and fresh paint. All bedrooms have private decks, high ceilings and tasteful moldings. The exterior includes lush and mature landscaping, window flower boxes, shutters, a 2-car detached garage & a large outside shower. 2 zone HVAC. Alarm system. Yes, there is room for a pool. Showings are scheduled by appointment. Don’t wait. Call today to make an appointment. You’ll be happy that you did!